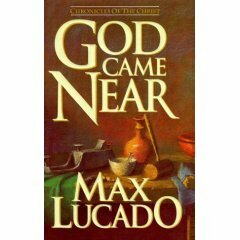 God Came Near is another powerful book written by Max Lucado. In his typical, easy to read, almost story book manner, Lucado takes great points of theology and makes them so simple anyone can grasp the meaning and power. My prayer for this book--without apologies-- is that the Divine Surgeon will use it as a delicate surgical tool to restore sight. That blurriness will be focused and darkness dispersed. [Here it comes...] That the Christ will emerge from a wavy figure walking out of a desert mirage to become the touchable face of a best friend. That we will lay our faces at the pierced feet and join Thomas in proclaiming, "My Lord and my God." And, most supremely, that we will whisper the secret of the universe, "We were eyewitnesses of his majesty." I would submit that he accomplishes his goal throughout the book. Divided into two main sections entitled "His Incarnation" and "Our Imitation" Lucado uses 31 chapters or more appropriately 31 short stories to talk about Jesus's life on earth and then how we should imitate His life. Christianity, in its purest form, is nothing more than seeing Jesus. Christian service, in its purest form, is nothing more than imitating him who we see. To see His Majesty and to imitate him, that is the sum of Christianity. We wonder, with so many miraculous testimonies around us, how we could escape God. But somehow we do. We live in an art gallery of divine creativity and yet we are content to gaze only at the carpet. As with many of Lucado's books, God Came Near includes a study guide section which can be used for individual devotion or group discussion to help deepen the impact of his inspired writings. With an openness to the power of the Holy Spirit in your life, this book can reshape your views about God, Jesus, and ultimately, the power He contains!